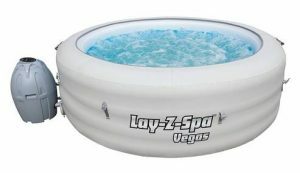 The Lay-Z-Spa Vegas is probably the most popular product in the current range of inflatable hot tubs – and for good reason. It has won ‘hot tub of the year’ multiple times and despite first being released in 2012, it’s had multiple revisions in the last five years to keep it’s features fresh and up to date with other spas in the market. In this post we invite you to take a look at our favourite product aspects and share some invaluable tips for installation that you won’t want to miss. If you don’t like missing out we suggest that you don’t make a decision on purchasing without reading our review and best price comparison below! Summary: The Vegas model has been available since early 2012 and is still amongst the most popular products in the Lay Z Spa range. Much of the enduring success of the product is a result of its simple yet effective design and popular features. The formula for this range is fairly simple: easy set-up in just 10 minutes, enough capacity to comfortably fit at least 4 people, 87 soothing jets to massage in 40C temperatures and crucially – unlike many other inflatable hot tubs in the market – the ability to heat the water and use the air jets simultaneously. This dual AirJet Massage System has won this tub plenty of admirers – and we have to admit we’re one of them! If you want a no frills hot tub at a tenth of the price of traditional spas – buy this product. It won’t let you down. We love the Vegas Lay Z Spa for the simple reason that it’s one of the cheapest in the current range, but still fits 4-6 people and has many of the same features and fittings as the more expensive products in the range. The tub fits more people than smaller spas in the range such as the Miami, but is nearly £100 cheaper than the best price for models such as the Paris tub. Despite its cheaper price tag, the tub has many of the features which have made Lazy Spa one of the clear leaders in the inflatable hot tub market. Thanks to a recent upgrade the heating and bubble system can be operated simultaneously, meaning there is no loss of temperature while the bubble system is active. The use of 87 air jets also brings the tub in line with most of the other spas in the range for power and comfort. One downside is that the tub does have a slightly lower water capacity than others in the range, meaning that it can be a squeeze to fit 6 people as the guidelines suggest. However this does mean that the water heats up quicker – making it easier to maintain temperatures. This model actually includes a timer controller unit which can be pre-set up to 72 hours in advance of you using the spa – which is a huge convenience since the water can take up to 10 hours to reach optimal temperatures of up to 40°C. We have seen a number of people concerned by the cost of electricity to run the tub. Most users report that the tub should cost around £10 a month with moderate use, while heavy daily use can cost as much as £30 per month in electricity. This should definitely be a consideration when calculating your budget and usage. In summary we recommend this tub if you’re looking for a simple, no frills spa at the best possible price. At just [amazon template=price&asin=B0068484UU] for everything – there are fewer price restrictions than ever to owning a spa in your own back garden! Top Tip: if you’re looking for a more advanced model, the Lazy Spa Paris was introduced in 2016 as an upgrade to the Vegas tub. While there aren’t huge differences between the two, the Paris model holds slightly more water and includes an LED lighting system with 7 display settings. It definitely has more of a visual appeal but with an admittedly higher price tag. The Vegas spa can be easily installed at home in as little as 10 minutes! Upon delivery you’ll receive with your parts a set-up DVD that clearly explains how to install your tub. You can also find this video online – and it should be used in conjunction with the accompanying user manual. To be honest it’s so simple to set-up that you probably won’t need either of these, but they’re there if you need them. We found installation to be as easy as plug-in, pump & inflate. It will probably take a few hours to fill and left overnight, should be well heated by the next day. Heating overnight can also save on costs as this is when electricity is generally cheapest. Some inflatable spas still don’t allow the use of the pump and the heating system at the same time. Thankfully Bestway have updated their entire range of tubs to include this as standard. No more turning the bubbles off while you wait for the tub to heat – bliss! Every tub comes with a digital control panel allowing you to control the heat of the water. This model also includes a timer controller heater unit, which means that you can schedule the heater to come on up to 72 hours beforehand. Given the water can take up to 10 hours to warm up, this is a real life saver. We have heard of some reports from users who’ve said that their digital control panel has had issues if exposed to too much sunlight. Generally we’ve heard good reports on Lay-Z-Spa being forthcoming with replacements, but we’d still advise that you try keep the units out of direct sunlight where possible. The tub has a built-in water filtration system which makes maintenance a breeze. These use filters which generally need replacing every few weeks depending on the levels of use. Note that the water will still require the use of Clearwater chemicals to maintain cleanliness, but this is generally very straight-forward upkeep – max 5 minutes per day. In our experience the main way in which dirt would find its way into the tub is on the feet of users walking barefoot through the garden or patio area before getting in. Installing the inflatable on decking or a clean area can really help to minimise the amount of times you need to clean the tub. This model is amongst the largest inflatables in the range, holding 848 litres of water at 80% capacity. We found this was generally enough space to comfortably hold 4-5 people – with 6 people possible, but cosy. If you need a tub that will comfortably fit 6 people, we’d recommend looking into the Palm Springs range, which holds 945 litres of water and is the biggest in the range. Generally, this spa has more than enough room for most needs. The product also comes with an insulated lid, installation DVD & filter cartridges. Top Tip: try installing the tub on decking or artificial grass to prevent dirt finding its way into the water.